A strong storm can wreak havoc on your roofing system. The type of damage your system sustains will vary depending on what type of weather event you experienced. 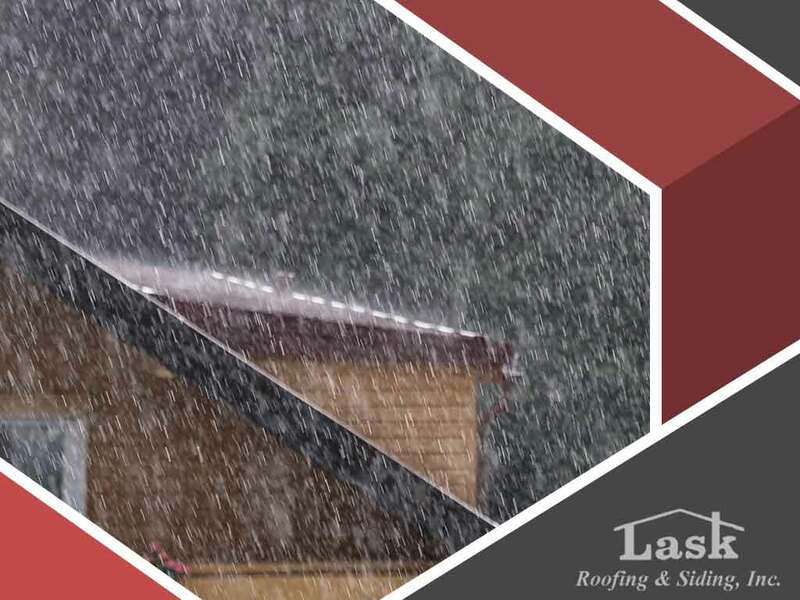 In today’s post, LASK Roofing and Siding, your trusted roofing contractor, describes the effects of various weather and environmental factors on your roof. Strong winds are some of the most powerful forces asphalt shingles have to endure. Sustained gales, fleeting gusts and powerful tornadoes can all cause significant damage. A gust of wind can blow off your shingles, while debris from a tornado can cause impact damage. Speaking of flying debris, your stationary roof is an easy target for large tree branches that have been dislodged during a storm. At high velocity, the impact could break a part of your system and create a massive crack, resulting in a leak. In addition, hailstones can dislodge the protective granules of asphalt roofing shingles, if not fracture them. These bruises are both a structural and cosmetic concern, meriting immediate professional attention. You don’t have to see puddles on the floor to know that water has invaded your home through your roof. Dark streaks on ceilings and walls, ruined paint and wallpaper and severe mold growth in the attic are telling signs of leakage. Although you should typically wait for the inclement weather to subside before inspecting your roof, active leaks may require emergency repairs to mitigate interior damage. While lightning-related fires don’t happen every day, they’re the most destructive. Reliable roofers would advise you to invest in roofing materials with an excellent fire rating to bolster your home’s protection against fire. When it comes to roof maintenance and storm damage restoration, LASK Roofing and Siding, Inc. is the name you can trust. We respond to emergency calls promptly and can deal with pressing roofing issues. Contact us at (815) 788-6699 now to schedule an appointment and get a free estimate in Rockford, IL.